'I am lately become a brewer for family use'1. Perhaps one of the most quoted lines from a letter by Thomas Jefferson to Joseph Coppinger, especially among enthusiastic homebrewers looking for presidential validation of their hobby. Beer was, in common with households throughout the recently established United States, central to life at Monticello, the plantation high on a hill that overlooks both Jefferson's childhood home of Shadwell and the city of Charlottesville. With an inherent distrust of water, and a culture that continued to share much with the mother country, citizens of the new republic had long taken beer for both nutrition and hydration, the Jeffersons were no different. Jefferson was particularly keen on Coppinger's book, 'The American Practical Brewer and Tanner'2, such obvious bedfellows, because it contained a procedure for 'malting Indian corn'. Jefferson didn't grow barley on his 5000 acre plantation, he did however raise corn and wheat. Therefore a method of malting the corn for use in beer would naturally be of interest. In the very same letter as the quote above, Jefferson notes he had followed the procedure the previous autumn 'with perfect success'. Out of these details has arisen the image of Thomas Jefferson, author of the Declaration of Independence, founder of the University of Virginia, and third president of the United States as an avid homebrewer. A homebrewer whose reputation and 'recipe' has been used by at least 2 breweries to create commercial beers trading on this very image. All this despite the fact that Jefferson wrote to his longtime friend, James Barbour that 'I have no reciept for brewing', going on to say that he doubted whether 'the operations of malting and brewing could be successfully performed from a reciept'3. "I am lately become a brewer for family use, having had the benefit of instruction to one of my people by an English brewer of the first order". Just by finishing off the quote, the image of Jefferson the homebrewer is shattered and a new image comes into view, that of the brewers of Monticello being an Englishman and one of his 'people', a thoroughly sanitized way of saying a slave. The Englishman was Joseph Miller, the slave was Peter Hemings. It was these men who in the autumn of 1814 perfected the malting of the corn tended by enslaved field hands and used it to make beer. Caught up in the machinations of the War of 1812, Captain Joseph Miller and his daughter were attempting to lay claim to inherited property in Norfolk, Virginia. Being citizens of the enemy, the Millers were ordered to head away from the coast of Virginia and eventually pitched up in Albemarle County, home of Thomas Jefferson. While unable to leave Albemarle County due to the war with Britain, Captain Miller became acquainted with the master of Monticello, who clearly valued the fact the Miller was a master brewer. Peter Hemings’ story is rather less documented, being one of Jefferson’s slaves that labored for his comfort. The story of Monticello is as much the story of the Hemings family as it is of the Jeffersons. The matriarch of the family was Betty Hemings4, the child of an African slave and an English sea captain, she belonged to Jefferson’s father in law, John Wayles. According to her grandson Madison, Betty bore 6 children to her master, including Peter and his better known sister, Sally, for whom Jefferson’s bride Martha Wayles would be a half-sister. There is in the long and tortured history of Virginia a recurring theme of shadow families, where a slave owner has taken one of his chattels as a concubine and produced children. Thus is was that Betty and her clan came to be at Monticello when John Wayles died and his shadow family became the property of his daughter and son-in-law. In the autumn of 1813 Captain Miller and Peter Hemings came together as master and pupil to perform the malting of grains and the brewing of beer for the big house on top of the small mountain, a task that Hemings learnt ‘with entire success’. Brewing in the late 18th and early 19th centuries was very much a manual affair, one without the pumps, valves, and automation that many brewers take for granted today. Hemings and Miller didn't have access to drills to power their grain mill, in fact we don't how they milled the malted wheat and corn they used for the beer. Did they have a donkey powered grindstone? Was is powered by other slaves? Was the malt ground at the flour mills on the nearby Rivanna River? Simply put, all we have is vaguely reasoned conjecture. Assuming the flour mills on the river were used and the brewing took place at the house itself, did they transport the grist on a horse and cart or on the backs of enslaved men up the hill? As I say we just don't know. We don't even know where the plantation brew house was. Though it was certainly part of Jefferson's schemes and plans, indeed the earliest designs for Monticello include spaces for brewing and storing beer, its location is yet to be discovered. Assuming it was near the main house, there was yet another problem faced by the Monticello brewers, that of water. Sure you know that water is 98% of the volume of beer, but what do you do without a reliable water source, without being able to just turn a tap and have fresh running water? When building the house, Jefferson had a well dug that was 65ft deep, took 45 days to dig, and failed 6 times before 1797.5 By 1810 Monticello was supplementing its well water with rainfall collected in leaky cisterns. If all else failed, there were springs on the mountainside6, or, at the bottom of the hill, the river and the back breaking task of hauling brewing liquor up the steep sides of the mountain. A sobering fact, forgive the pun, when you remember that for every pint of beer brewed, another 3 or 4 pints of water are used. Just having the basics required to make the wort likely involved more hard work than many a modern home brewing enthusiast would care to do, including growing the corn and wheat. Barley wasn't grown at Monticello, hence Jefferson's eagerness to find Coppinger's book and a method for malting a grain that grew readily in the red clay soils of Virginia. As well as growing and malting the grains needed for the wort, Jefferson's garden supplied at least some of the hops required to add bitterness to counteract the sweet wort, though right up to the year he died the household would buy in hops for brewing. I often wonder what kind of beer these men from very different backgrounds brewed as they worked together in the Monticello brew house, especially given the very different beers put out by Yard's and Starr Hill claiming to represent Jefferson's well regarded table beer. Yard's Thomas Jefferson Tavern Ale uses honey, wheat, and rye, claiming it is “just like the beer Jefferson made at Monticello”.8 Closer to Jefferson’s home, Starr Hill Monticello is made from just malted wheat and corn and is as pale as many a witbier9. While having a very definite opinion as to which I prefer to drink, I am not convinced that either truly represent what was actually brewed in Jefferson's time. In reading Coppinger's treatise on the use of Indian corn in brewing, the author states that the end product is “peculiarly adapted to the brewing of porter”. Porter of course was a well-known style of beer in the newly formed United States. Even during his days fighting for the British in the French and Indian War, George Washington was making porter from a recipe that used copious amounts of molasses to provide the fermentable sugars, as well as rich dark color associated with this beer style. Did Hemings and Miller take Coppinger's advice and supplement their Indian Corn based wort with molasses to make porter for Jefferson, his household, and his guests? Perhaps they used the knowledge gleaned from Michael Combrune's "The Theory and Practice of Brewing" to produce malts ranging in color from pale to dark so that they could produce different types of beer as required. Sadly we will never really know what kind of beer the brewers of Monticello actually made. What we can be sure of though was that the beer was served to an appreciative audience in the dining room where Jefferson welcomed his friends and guests. As Hemings continued brewing the beers for Monticello, requests came in from Jefferson's acquaintances for a recipe so that they might reproduce the beer they so enjoyed. Another fan of the beer being served at Monticello was James Madison, longtime colleague of Jefferson, and the man that succeeded him as president of the United States. Madison's own plantation, Montpelier, is only about 20 miles from Monticello, and Jefferson encouraged Madison to send someone to participate in the brewing so that he might learn and take that knowledge back there. In the very same letter, Jefferson notes that 'our malter and brewer', presumably Peter Hemings, 'is uncommonly intelligent and capable of giving instruction'12, an observation that gives us the merest hint of the esteem with which Jefferson held this particular member of the remarkable Hemings clan. We do however, in the letters of Jefferson to Barbour and Madison, have some insights into the kind of beer that Peter Hemings was producing. We know for example that the autumnal brewing consisted of three 60 gallon casks of ale, or about 680 liters, and used a bushel of malt to every eight to ten gallons. A US bushel weighs somewhere between 32 and 34lbs, so at a bushel of malt per 10 gallon cask, you are looking at a starting gravity somewhere around 1.100 or 24° Plato. With a 24° wort, and assuming an attenuation of about 70%, Peter Hemings' highly regard ale was likely somewhere in the region of 9% abv. In the same letter to Barbour, Jefferson notes that commercial brewers were squeezing fifteen gallons from a single bushel of grain, claiming that such beer was “often vapid”13. In many ways the legend that has sprung up around Jefferson and brewing is an archetype of the modern craft brewing industry, with Jefferson the first 'rock star brewer' trading on a rootsy image of self-sufficiency which doesn't stand up to inspection. Jefferson may have described himself as 'a brewer for family use' but as we have seen he didn't actually engage in the activity of brewing, leaving it to a slave, who Jefferson would never set free, and the stranded Englishman that trained him. The 'intelligent Briton' would in time be able to claim the inheritance in Norfolk which had prompted his leaving England just as rumors of war were doing the rounds. The years of neglect though had great diminished the value of his inheritance, and despite Jefferson lobbying for his citizenship of the United States to be recognized given his birth in Maryland, there is no record of him trading as a brewer in the new world, despite Jefferson's fulsome praise. Eventually Captain Miller's daughter would purchase an estate just outside Charlottesville14. Peter Hemings was the man that brewed the beer that garnered such respect from Jefferson's contemporaries, yet history turns a blind eye, ignoring him and his many talents – as well as learning malting and brewing, Peter was a skilled chef, having been trained by his older brother James, who himself learnt his craft in Paris while in Jefferson was the US ambassador to France. After Jefferson died on July 4th 1826, Peter would be sold on as Martha Jefferson sought to pay off the vast debts built up by her father. Hemings’ new owner would give Peter his manumission and he would see out his free days as a tailor in Charlottesville15. Despite the reality of Monticello's beers not being brewed by Jefferson in any meaningful sense, there is a deeper truth to be taken from this triumvirate, and that is the centrality of beer to life at the time. Everyone drank beer, from the humblest farm hand to the men that sat in seats of power. The brewing of beer was part and parcel of everyday life for pretty much every household, given that commercial brewing was very much in its infancy, and the skills taught by Miller to Hemings, with Jefferson's keen eye for observation looking on, were those that had been passed down through generations of Englishmen, on both sides of the Pond. Who knows what was discussed by these men as they stood around the mash tun and kettle during one of the spring or autumn brewing sessions. I can half imagine them having the most mundane of chats, what was growing well in the garden, the price of hops, the continuing building of the University of Virginia, and probably even that perennial favorite, the weather. One thing I feel would be for certain, it wouldn't be a time of grand political or philosophical exchanges, or even salacious gossip fresh from Main Street in Charlottesville. The conversation would likely weave around the everyday experiences and lives of the brewers of Monticello, just as the beer they were brewing would, given time, take its place as an everyday part of life at the house on the hill. I was in a distinctly lagerish mood, and we had considered heading to Beer Run's sister place, Kardinal Hall as they have the magnificent Rothaus Pils always on tap. Yes you read that correctly, the finest pilsner in all of Germany is always on tap in Charlottesville, Virginia. Sadly they would not open for another couple of hours, so that wasn't an option. I don't know about other folks, but there are times when only a lager will suit my mood, when all I want is the clean snap of a technically proficient bottom fermented beer, something cracker dry that just cuts through the gunk of life and leaves me refreshed. This day at Beer Run, only one beer on the this met these requirements, but I was hesitant as I had never ordered it on draft before, actually thinking about it, I can't think of that many places where I have even seen it on draft. That beer was Budweiser, the American one, not one of the Czech ones, and Beer Run knowing me as they do, brought me a 20oz pint of it. I am assuming that this particular pint was brewed just down the road at Anheuser-Busch's Williamburg brewery and so there is no irony whatsoever in the 'drink local' beer mat, especially if people are happy to called Stone in Richmond, Green Flash in Virginia Beach, and soon to be Deschutes in Roanoke, 'local'. 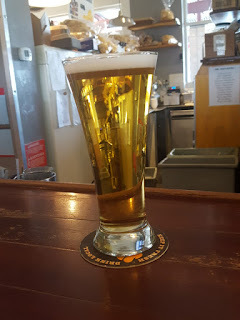 As I said, this was the first time I can ever remember ordering a full pint of Budweiser in a bar, though I recently reviewed the bottled version here, so I wasn't sure what to expect. Attempting to put to one side all those inherent craft prejudices and focus on the beer itself in the glass, I plunged on in. It hit the spot. Cold, though not ice cold, clean, crisp, cracker dry, and with a short, sharp finish. It was perfect, absolutely perfect for the mood I was in at the moment. 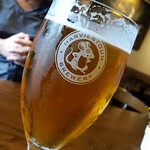 I didn't want to be challenged, I didn't want to prove my craft credentials and feel worthy of drinking a beer, I didn't want to wrap my head round a muddle of flavours and aromas that may or may not have been intentional. I wanted a lager that was expertly brewed, technically solid, and through which quality brewing science shone, and this was that beer in that moment. I can't comment on how the beer changed as it lingered in the glass, because it didn't linger, 4 mouthfuls saw to the pint quite handily. One thing I noticed about the draft version over the canned version was that the draft felt much less fizzy, and the beer was greatly improved by that fact. So there we go, I doubt I will ever become a regular Bud drinker when I am out in the watering holes of the United States, but neither will I shy away from ordering it on tap if I faced with a bank of IPAs of indeterminate provenance. Funny what happens when we overcome our prejudices and snobbery.